Charlie has been racing since 1973 when he ran a self-prepared Lotus Super 7, notching 20 SCCA victories and three divisional championships. He has competed in IndyCars and the great endurance races at Daytona, Sebring and Le Mans. He regularly runs his Williams FW07B/06 in historic races. 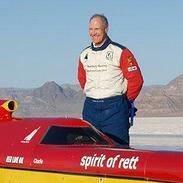 Following his son Rett’s death in 2005, Charlie has focused on racing the “Spirit of Rett” streamliner at Bonneville. He now holds the 6 fastest unblown records at Bonneville at 348, 350, 360, 368, 392, and 414 MPH respectively.